The latest Season 2 character announced. Street Fighter V will add Abigail from Final Fight as a playable character on July 25, Capcom announced at Evolution 2017. A new stage, the “Metro City Bay Area,” will launch alongside Abigail on July 25. 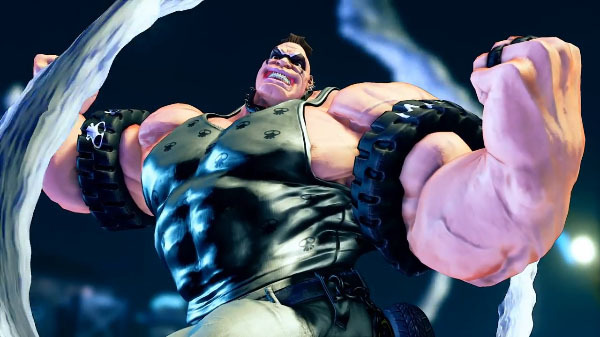 Making his way from Final Fight to Street Fighter V, Abigail was one of the top ranking members of the Mad Gear Gang. His territory is the Bay Area of Metro City, a location he terrorizes with his gargantuan size, and at eight feet tall, he makes the Red Cyclone look like a spinning top. The tires around Abigail’s monstrous biceps make is clear what he’s been up to when he isn’t cracking skulls. This mountain of a man is a complete (mad) gear head that loves to make car noises almost as much as he loves driving them. As the largest character in the game, you’d expect Abigail to be all about the command grabs. He has two, as it happens, but what makes him stand out is his Nitro Charge run. This special move has one hit of armour (two for EX!) and can be cancelled into four follow-ups – a stiff punch, command grab, cumbersome overhead or V-Skill. Suffice to say, Abigail isn’t a one-trick-pony, he’s a horse-power-house. Also arriving alongside Abigail are his Story and Premium Battle costumes, as well as his own personal stage, the Metro City Bay Area. Fight on this stage long enough and you might see the iconic sunrise that fans will remember from back in Abigail’s Final Fight days. Abigail will be obtainable using in-game Fight Money or via the Street Fighter V Season 2 Character Pass, which is available now for $29.99 / £24.99 / €29.99 and includes Akuma, Kolin, Ed, Abigail, and two new fighters to be announced later this year, in addition to Premium Battle Costumes with colors 3-to-10 unlocked and default costume colors 3-to-10 for each character. The new stage can also be purchased using Fight Money. Watch the Abigail reveal trailer below. View a set of screenshots at the gallery.